The PILOT 2-10 pound (1-4.5kg) weight range will work with a wide array of cameras. The new Steadicam Pilot is a state of the art, lightweight stabilizer system designed especially for the modern breed of lightweight cameras from2 to 10 pounds (1-4.5kg). Video professionals need add only battery and camera of choice as all other required system components are provided for normal operation. The Optional SteadiStand or Turtle Base "C" Stand, required for Steadicam balance and operation, fits neatly in the available soft carry case. 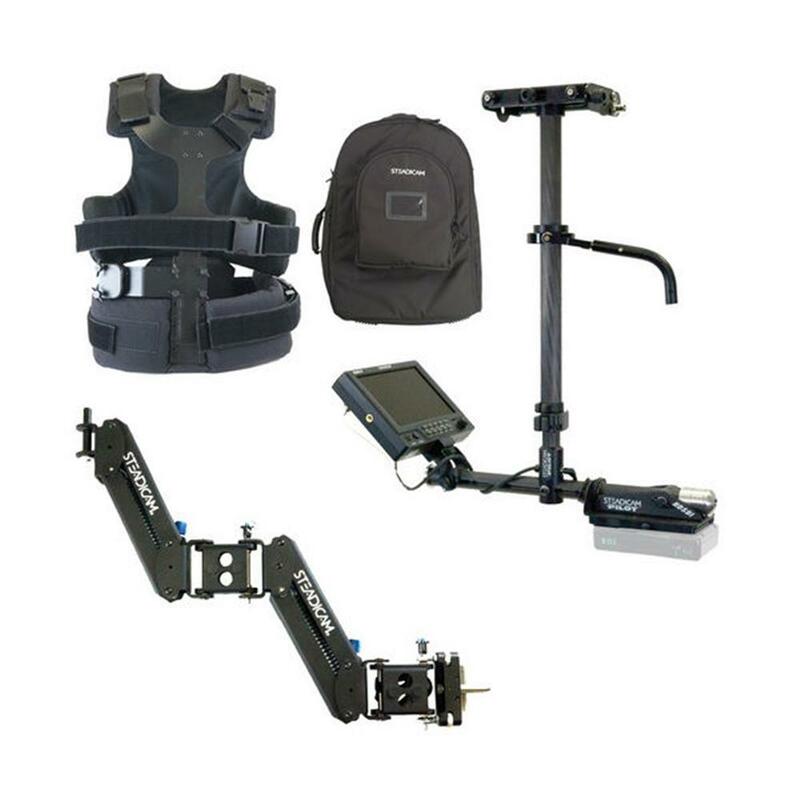 The Steadicam Pilot is designed with a lightweight Iso-elastic Arm and ultra low profile vest, lightweight sled with CarbonLite expandable post, upgradeable color 5.8" LCD Monitor, low mass gimbal and offers advanced features/benefits with low cost for the Video Professional. The Iso-Elastic arm is a two-section, articulated, design that can be adjusted while supporting the camera. With this patented, unique design, the Steadicam operator can smoothly and effortlessly raise or lower the arm throughout its 28" (71cm) boom range. The iso-elastic arm is also non-reactive - improving vertical stability and control in all operating conditions, from lock-offs to fast running shots over rough terrain. The 5.8" LCD monitor is standard and provides good contrast from dark to light situations. The monitor weight and location on the sled assures the operator perfect balance and ease of operation. Utilizing a proven Low Mass Gimbal the operator has the ability to capture the fluid movement that only Steadicam can provide. No-tools precision camera stage establishes a solid base for the camera and facilitates smooth adjustment ease from side to side plus fore and aft. The Steadicam Pilot is HD Ready, allowing the monitor to be upgradeable to a 7" HD/SDI LCD. The Carbonlite expandable post and interface to the stage form a solid bond to assure no jitter in the picture as the operator captures those unique scenes. The stage plate is indexed so that the camera can be re-moved and re-mounted without the need to re-adjust the balance. The stage can be easily accessorized with focus motor mount, additional connectors or dovetail type camera plate. The Pilot sled compacts down by removing the lower cross tube. The Pilot's ultra lightweight, low profile vest is designed to provide complete comfort and functionality for extended productions and long continuous shots. No-tools adjustments make it easy to adjust on the "fly".